Add rustic warmth and style to your Home with our Handmade 100% natural cotton cord. This floating Macrame shelf design adds easy style and modern appeal to any room. you can display plants,cactus, succulents, flowers, decor, collectables in a modern, unique way without adding clutter or taking up floor space. * Size: This macrame hanging shelf is approximately 30" in height including the tassel, wooden shelf is about 12"x 12", 1/2" thickness. * Material: cotton. Strong and durable. Great for indoor and outdoor use. * Versatile style that can be hung from a hook in the ceiling or against a wall like a wall hanging. Add a rustic warmth and style to your home with our Handmade 100% natural cotton Macrame shelf planter. This floating Macrame shelf design adds easy style and modern appeal to any room. you can display your plants, cactus, decor, collectables in a modern, unique way without taking up floor space, to enhance your home without adding clutter. Our beautifully crafted Macrame Planters with sleek Rustic wood shelf can be used indoor or outdoors. it's a gorgeous, unique way to display your treasured plants, decor, including photos, sculptures and artwork. hang a few of these beautiful pieces in your home to add personal touches and a unique look that lends a custom vibe to your home. Take your beloved plants and put them on display, effortlessly. Our versatile shelf planters let you create your very own one-of-a-kind wall decor. Transform greenery into works of art with our Handmade Macrame planters. it's a perfect unique gift for all occasions. The props in the photos are not included. 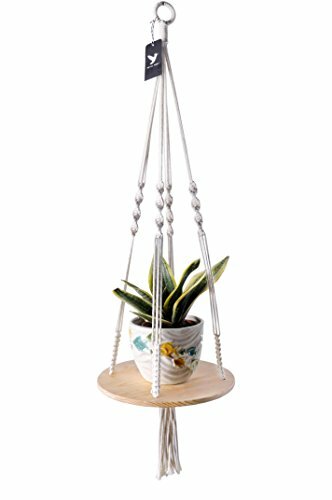 Material and Size: This macrame hanging shelf is 100% Natural Cotton cord. it's approximately 44" in height including the tassel, wooden shelf is about 12"x 12", 1/2" thickness. * Versatile style that can be hung from a hook in the ceiling or against a wall like a wall hanging. If you have any questions about this product by Royal Nest, contact us by completing and submitting the form below. If you are looking for a specif part number, please include it with your message.